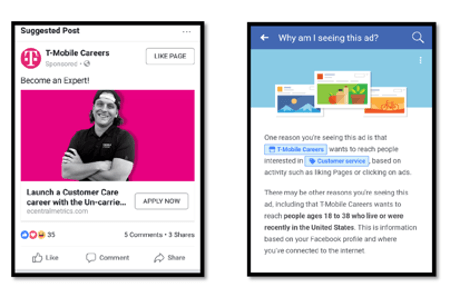 A nationwide class action filed in federal court in California charges that hundreds of employers around the country, including T-Mobile, Amazon.com, Cox Communications, Inc., Weichert Realtors, and Verizon, as well as employment agencies, routinely exclude older workers from seeing their employment and recruiting ads on Facebook. The suit, Communications Workers of America v. T-Mobile, 17-cv-7232 (N.D. Ca. Dec. 20, 2017) claims that these companies intentionally prevent older workers from receiving job ads by specifically targeting their employment ads to younger workers via Facebook’s ad platform. This is not the first time that Facebook ads have generated employment law controversy. After an October, 2016 report by ProPublica criticized the social media giant for allowing advertisers to deliberately block ads from going to people with what it called “ethnic affinities”, such as Hispanics, Asian-Americans, and African Americans, Facebook changed its policy in November, 2016, and now bars advertisers for housing, employment, and credit opportunities from targeting or excluding those groups. What this means to you: Every employer wants to find the best employees. Hiring the right candidates can put your company ahead of the competition and reduce the high cost of turnover. In order to be successful, managers must develop staffing strategies that will support them in selecting top talent and avoid the wrong candidates. But, it is equally important that employers provide true equal employment opportunity to all potential applicants, no matter what their age, ethnicity, or other protected characteristics. Executives, managers, supervisors, and leads who participate in the interviewing and hiring process should be trained on effective (and legal!) interviewing and selecting qualified job applicants. Fair Measures’ Hiring the Best program includes your organization’s policies and procedures, small group discussion, case studies and extensive Q & A. When it comes to behavior interviewing and interviewing technique tips, our instructors are seasoned attorneys, experienced trainers, and skilled facilitators who use personal stories and appropriate humor to make this topic come alive! To find out more about our training programs or to book a workshop, please call 800-458-2778 or email training@fairmeasures.com.